At the height of the karate fever both in and out of Okinawa, the young martial artists of Naha and Shuri gathered together to conclude that "karate must be practical and all impractical theories must be abandoned." They invited karate senior, Choki Motobu, who was the most skilled practical self-defense (jissen) martial artist at that time, to meet with them on the 7th of the month at 8 p.m. at the Tsuji Uenorō Restaurant. They interviewed the master about his practical form of jissen and his personal experiences. 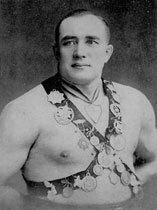 Elder master Motobu had a strong and powerful physique, and did not look like a man who was already over 60 years old. Among the people who came to listen to this interview were: Chōkei Takamine, Shōshin Nagamine, Angi Uezu of the Naha Police Department , Tarō Shimabukuro, Ryōsho Kin from Shuri, Ryōkichi Miyazato from Kakinohana, and Shichirō Yanagisawa of the Okinawa Prefecture Educational Department. As they sat around the elder master Choki Motobu, these men who shared their common interest in karate, engaged in heated martial art talks among themselves. Everyone was very excited about these karate discussions. At their conclusion, elder master Choki Motobu stood up and demonstrated kata and actual techniques, using the young men in the group as his partners (uke). Motobu took down these young men, each in the prime of his life, one after another. The stories written in this article were Elder Bushi Motobu's very interesting answers to all the questions posed regarding his youth, street fighting experiences, teachers etc. The way to make the fist is different now than the way we were taught in the old days when we were 12 or 13 years old. It was flat or open hand (hirate) in the old days. 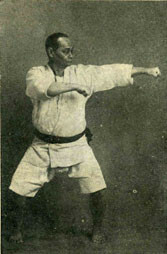 Today, they use thrust fist (tsuki ken) strikes that go forward and in a downward direction (called running water), but in the old days there was no such hand technique. In the old days, it was a straight strike that went slightly upward. I believe that this was Matsumura's style from Shuri. Sakuma Sensei's kata and Matsumura Sensei's kata were same. These were old style kata. We learned to pull back our fist on the side, directly under the arm after a strike. However, today when you pull back after a strike, you bring your fist back to your hip (the lower side of your abdomen). This never works during an actual fight. I believe that the proper technique is to put power and strength into pulling back your fist. Today this looks to me very strange, to put so much power into striking with your fist. I would use only 80% of power when I extend a strike with my fist, but 100% of power when I pull it back. I was taught by the renowned Matsumura1 and the renowned Sakuma,2 both from Shuri. I was also taught by Matsumora3 from Tomari, Pēchin Kunigami (Kunjan in Okinawan) and Itosu,4 as well as on occasion by "Yanbaru" Kunishi5 from Kumoji. Among all these instructors, the two with whom I was closest and shared emotional bonds with were Matsumora from Tomari, and Sakuma from Shuri. I was scolded a great deal during my training with them. However, Sakuma Sensei taught me a lot by both, complimenting me at times and scolding me at others. I started to get real ability and competence by practicing kumite with him, and thus began to treat my friends like small children <in regards to their skill level>. Matsumora from Tomari was about 5 feet, 4 inches tall, about 1 inch taller than us, and weighed about 159 pounds. He looked just like a huge jug! His karate was totally different than Itosu's. When it came to power, Sakuma was just like Matsumora and a truly powerful martial artist, a bushi. 2. Sakuma Pēchin: The head of Sakuma Dunchi (noble samurai family). In Choki sensei's Watashi no karate-jutsu, he praises Sakuma Pēchin as "Sakuma the Wise." Compared to our ancient instructors, I don't think there are any skilled martial artists among today's samurai (bushi.) I think that today's young bushi are only practicing. If you want my opinion, there is not even true warrior in today's world. Matsumora from Tomari and some others used to go to Katabaru at night when the moon was very bright. There they trained so hard that they could not even get up by themselves because of aching backs and legs. All their body parts were so sore, that when they reached their homes around dawn, they were unable to even crawl inside. So they lay down at the entrances where they fell asleep. They were too tired to go to their bedrooms. This was how hard they used to train in those days. They trained and studied kata and kumite at the same time. What was the goal of the ancient martial artists? In the old days, we used to go to Sensei's house secretly and quietly in order to learn techniques. We went to visit Sensei before dawn while it was very dark, so that we would not be seen by anyone else. When we were training by hitting the makiwara, we were not supposed to make any noise. Also when we trained with bo, we were not allowed to make the tick, tick, tick (kachi, kachi - the sound of the bo) noise caused by hitting two bo together, so we had to wrap our with straw. This happened when I was 20 years old. When Kameya, Yabu1 and my older brother (Chōyu Motobu) went to see Matsumora Sensei in Tomari for instruction, Matsumora Sensei asked them a question about how to block a certain attack. I heard that they could not figure out the answer even though they tried very hard to come up with it for a whole week. So I told them, "I can do it right away. It's a piece of cake." My older brother and his friends became very angry about what I said. They said, "We will bet you 10 yen that you can't block that attack." We all went to Matsumora Sensei's place and I asked him, "May I show you how to block that attack in front of you ? I think that I know the answer to the homework question you posed to my brother and his friends the other day." Then I demonstrated the technique, easily blocking the attack. "How did you figure out this answer ? I never taught anyone this technique before. Who is your teacher ?" "My sensei is Itosu", I replied. "I know Itosu very well. Can you bring Itosu here since you are his student ? ", Matsumora asked. "Yes, I can", I answered. "This young man is very gifted. He has a great future. So let's train him together." After that, I received instruction from Matsumora Sensei. Itosu said to me, "Matsumora is a trully great bushi." He always praised Matsumora. This was how the bet was resolved. I won the bet and earned 10 yen. Ha, ha, ha. There is no such technique in real fighting as to block with the left hand and punch / thrust with the right hand, or to block with the right hand and hit / thrust with the left. The hand used to block should also attack the enemy at the same time. It has to be one movement, not two separate movements of the hand. Today's kumite is just imitating karate kata. That does not work at all when it come to jissen. 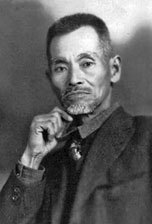 Kin Ryōjin (1873 - 1936). A musician of Ryūkyuan classical music. The head of Kin Dunchi (noble samurai family). "My father, Mr. Ryōjin Kin, used to tell me very often that you (Mr. Motobu) are a real bushi, samurai. My father also told me that Matsumora remarked about you, that 'When the man called Choki Motobu came to my (Matsumora's) place, we practiced kumite. Motobu punched my face one time during kumite training. I really thought this Motobu had great martial arts skills for such a young man.' Matsumora Sensei praised your skill greatly. Was this story true?" Motobu answered, "It happened when I was 19. I went to Matsumora's place with Tamashiro from Kariya1 who was a Sumo wrestler, and I received kumite training there. Matsumora Sensei threw a punch at me. My hand blocked the punch and hit straight into Sensei's (Matsumora's) face. His teeth immediately begun to bleed. I took one step back and said, 'I am very sorry, Sensei.' But Sensei insisted, 'Don't stop, just keep punching and hitting me continuously.' Then I felt great, becoming more excited and kept on training. This was a true story. I never told anyone about this incident, but Yabu used to tell me that he knew about it." Motobu continued: "There was a bushi named Kameya from Shuri Kubagawa. He was ten years older than me and very strong. I could barely block his attack with two hands. He used to treat me roughly from the ages of of eighteen or nineteen to twenty-one or twenty-two. So I trained very hard, and when I turned twenty-three, he couldn't beat me any more." 1. The site of former magistrate's office of Satsuma in Naha. On one occation, Hanashiro,1 Chikara ("Strong") Takaesu from Īfu, Nakandakari from Mike, Yabu, and others got together and tried to get into Yabu's favorite social club at Shittaimon gate of Tsuji. I happened to see them going into that social club but I didn't want them to notice me. So I wore a mask (kōgakī in Okinawan), and I bumped into Strong Takaesu. In return, he decided to charge at me twice. I blocked his attacks and punched him two times. Takaesu lost his balance and couldn't walk straight. There was no way that he could challenge me anymore. Hanashiro, Yabu, and the others just stood there watching, and never attempted to help him. Then many more men tried to get inside the social club. I clapped my hands and removed the mask, laughing. They finally saw that it was me. Hanashiro and Yabu exclaimed: "We suspected that there could only be one man who could be able to make Takaesu that helpless and immobilized, and sure enough, it was you!" We all laughed together and went to have drinks. This is the story when I met Okuyama, the manager of landlord of the Katabaru area. He was also Naha's bushi. I was 30 years old at the time. Together with Yabu, we visited his favorite social club. On the way home, several of Naha's bushi surrounded us at the top of a sloping street corner. There, they attacked us. I stepped backward and took one guy down instantly - he collapsed right on the ground. Others saw what happened and they became frightened, then ran like hell ! When I went to see the village festival of Nishibaru Onaha with several people including the respected elder Itarashiki,1 I didn't notice that a group of men armed with bo (six foot wooden staff),2 were saying something behind my back. Suddenly they closed in and hit my hand with their bo. The bo bounced off and hit my groin. I squatted down and bore the pain. As soon as the pain was gone, I knocked down one of the attackers who was standing behind me. Then a riot broke out ! About seventy or eighty men with bo suddenly surrounded us and started to attack us. The people who came with me to the festival escaped right away. I had to fight all those enemies alone. Eventually, I jumped over a stone fence and hid among some bushes. Later, I luckily bumped into Shuri, who were holding lighted lanterns. They had come to look for me because they thought "Motobu must be dead after that riot." My parents were among them. I didn't want my parents to be worried about me, so I filled up both of my kimono sleeves with sand to eliminate all the wrinkles and tried to straighten them out after this brutal street fight. I told my parents, "Nothing happened, there was no riot." But there sure was and it was some riot! 2. The "Bo" in the story refers to a traditional long staff Bo used for dancing, not a weapon. Although in the story, the people used in as weapon in the riot. John Kentel. Photo courtesy of Charles C. Goodin. I think it was around 1923 (Taisho 12).1 I went to watch a match with the foreign boxer John "somebody" in Kyoto. The boxer fought against a Judo stylist for the first match. This boxer fought very sluggishly. He looked like an amateur. I applied to challenge this boxer and bet money on the match. I was already over fifty years old at that time. I didn't have a chance to fight that day, so I went back there the next day. When I said (to the referee) that I would fight without groves, this boxer despised me, because he was much taller than me. And he treated me like a child, as he held my nose and twisted my cheek. I did not fight seriously during the first round and we took a break. When I got up to fight the second round, I suddenly thought, "If I am defeated by such a foreign boxer, it will shame both karate and Okinawa. I want to beat this opponent." I determined to win the fight. As soon as the boxer came forward to attack with his full power, I hit his temple very hard with one punch in a rage. He collapsed right there. All the spectators got very excited, and with a thunderous round of applause, started to throw their floor cushions, cigarette holders, drawstring coin purses, and other things toward me. It was such an exciting event, because such a big boxer (about 6 feet tall), and was knocked out by a karate technique. Many newspaper articles stated that I hit the boxer with a flat (open) hand. However, I did not use the flat of my hand to hit him. I hit him with my fist, but the spectators thought my hand was flat since I hit him so fast; it was lightning fast. The essence of karate is to move gently or casually, then immediately and explosively hit the enemy when the opportunity presents itself. This is karate jissen, actual fighting. 1. 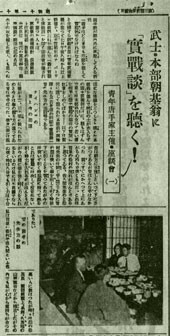 In the interview in Ryukyu shimpo, Choki Motobu Sensei’s best guess recollection was that his fight with the boxer took place in 1923 (Taisho 12). Conversely, the King magazine　(1925 issue), stated that this famous event took place in November 1922 (Taisho 11).